RyanAvenueA notes that firefighters were on the scene this morning at 20 Avenue A at Second Street. Residents said that they smelled smoke. One firefighter on the scene said that everything was OK, though he didn't provide any further details. 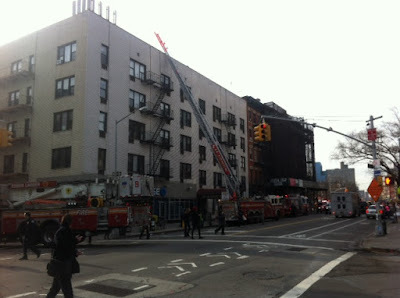 A major roof fire broke out next door at 240 Houston back in July 2010. What the hell is up with 240 Houston anyway? There were workers there this morning for the first time in months. It looks like all construction - roof repair and Union Market - were halted completely for at least 6 months. For what?